Despite the markets surging to new highs, these retail stocks missed the memo and had pretty rough weeks. The stock markets are on fire, in a good way, with the S&P 500 and Dow Jones Industrial Average both moving more than 3% higher for the week and closing at record highs. In fact, the S&P 500 marked its longest win streak since June 2014, with six consecutive sessions of gains through Friday. Naturally, we can't have a great week in the stock market without someone predicting doom and gloom, but in this case the one making the prediction might be accurate. "The relative-strength index hints at deepening overbought conditions in the U.S. stock markets, suggesting that the time for a correction could be approaching," said Ipek Ozkardeskaya, senior market analyst at London Capital Group, speaking with MarketWatch. 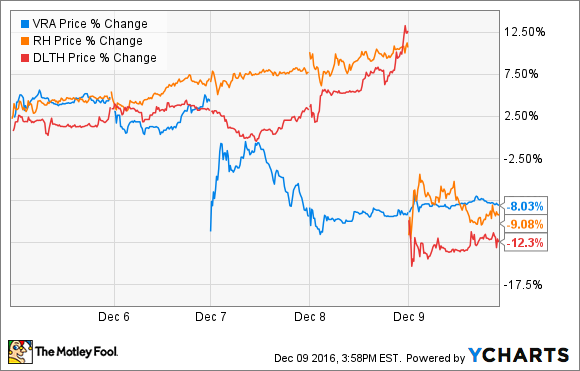 With the markets on fire in a good way, these three retailers missed the memo and were on fire in a bad way. It was a wild ride Wednesday for investors of Vera Bradley, Inc. (NASDAQ:VRA), as the handbag and luggage company disappointed Wall Street with its fiscal third-quarter 2017 results and sent the stock nearly 12% lower before recovering most of that amount, and then giving much of those gains back. The roller-coaster ride ended with Vera Bradley down 8% for the week. The bad news was that the weaker-than-expected top line filtered to the bottom line: Its adjusted net income checked in at $7.2 million, or $0.20 per share, down from $10.3 million, or $0.27 per share, from the prior year and below Wall Street estimates of $0.22. Lastly, Vera Bradley expects fourth-quarter revenue to check in between $135 million and $140 million, down significantly from last year's $154.1 million, suggesting that management foresees a weaker holiday period – nothing investors wanted to hear coming out of the company's earnings report this week. You've probably seen Duluth Holdings Inc. (NASDAQ:DLTH) commercials, including the one for its Buck Naked Underwear, which I can't seem to avoid on television. But despite posting an impressive string of revenue increases, all good things must come to an end. "While we have achieved 27 consecutive quarters of increased net sales year over year, third-quarter net sales fell short of our expectations," said CEO Stephanie Pugliese. "In the latter part of September and through the quarter end in October, we experienced unusually warm weather that extended across the country, and this had an impact on our total net sales for the third quarter. This unseasonable weather, coupled with a highly promotional environment, continued into the early fourth quarter." Graphic source: Duluth Trading's Hoffman Estates analyst day presentation. That graphic suggests that if Duluth can just get consumers wearing its pants and using its other products, things will be just fine -- and there's plenty of room to grow, with only 16 open stores and so many consumers remaining to be enlightened about its products. Sometimes in the stock market, even when companies win, they lose. Ask Detroit automakers, for instance, as they post record profits and investors continue to bail. It's a similar theme for Restoration Hardware (NYSE:RH) this week, after declining 9% despite beating Wall Street estimates. More specifically, Restoration Hardware posted third-quarter fiscal 2017 revenues of $549.3 million, above estimates calling for $527.1 million, but a meager 3% gain over the prior year's third quarter. Direct revenue dragged the results down -- store revenue increased 9% to $306.8 million, but direct revenue decreased 3% to $242.5 million. On the bottom line, Restoration Hardware's adjusted earnings per share checked in at $0.20 per share, which was much lower than last year's $0.65, but at least above Wall Street estimates of $0.16. The real killer of the stock price from the third quarter was management's guidance for the holiday season and fourth quarter, when it expects revenue to be between $562 million and $592 million, far below last year's $647 million. During the same time frame, it now expects adjusted earnings to reach between $0.60 and $0.70 per share, far below last year's $0.98 per share. The third quarter is merely a reminder that Restoration Hardware has thus far failed to reignite its business, but longer term, if the company can figure things out, it could be a rebound opportunity, after shedding 66% of its stock price over the past year.